Boy, oh boy, has the top blown off the new performance car market. Ford Australia - the once Herculean company behind the legendary Falcon GTHO Phase III - has finally kicked off its fluffy moccasins and tied the knot on a pair of steel-capped head kickin' boots. Forget about their recent smorgasbord of breathless old-school engines - the latest hi-po BA donks, especially the XR6's turbo six, are impressive even from a world outlook. I mean, where else on earth can you buy a six-pot turbo that pumps out a massive 240kW - and at a price within reach of many an average person. No question, Ford Australia has stepped into the ring with enough muscle to knock out everything except HSV's $100,000 obscenity, otherwise known as the SV300. Not only that, the current breed of Falcon is something of a milestone for Aussie supercar history. With the low boost turbo six good for 240kW and the (yet to be introduced) XR8's DOHC 5.4-litre V8 boasting up to 260kW, the Falcon GTHO Phase III's reputation as the wildest Oz sedan is under attack. That lumpy-as-you-like 4-barrel carb'd, high compression, big cam'd, 5.8-litre Cleveland was good for 'only' 254kW (claimed). If you're one to believe manufacturer's power figures, that means the new XR8 donk knocks the wind out of the mighty Ho-ey! Furthermore, the new 5.4 is light-years ahead in NVH, fuel consumption, drivability and emissions. All-round it's a much better thing. Looking toward the performance six, I find it interesting that only now Ford has now decided to turbocharge their 4.0-litre six. 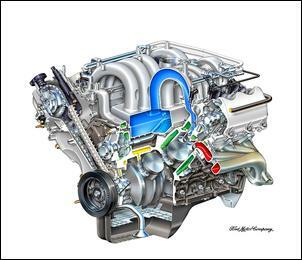 The aftermarket turbocharger industry devised their own turbo kit for the same engine barely months after the 1988 EA Falcon's release, and - like Ford - they discovered only mild boost pressure achieves some incredible power hikes. Push a couple psi into the guts of any big-cube motor and that's what you'll get! The absolute hottest 4.0-litre turbo Falcon six that jumps to my mind is AVO's red beast, which was built to break the world's fastest caravan tow record. This motor is hung with massive turbo, external wastegate, massive intercooler and programmable management and screams out an amazing 314kW at the back wheels! 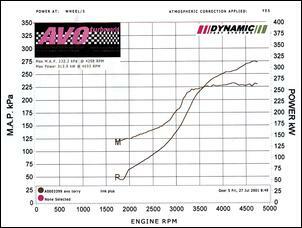 Interestingly, though, AVO told us the 4.0-litre doesn't like to rev more than 4800 rpm - "no matter what your do". I reckon, with Ford's new DOHC head, however, high(er) revs should be less of an issue. The first recommendation listed in the Guide to Modifying Turbocharged Cars relates to the exhaust - you'd unbolt the stockie system and whack on something that'll flow more cfm with minimal restriction. Given the huge volume of air that this motor inevitably flows, it might be wise to opt for a pipe larger than the popular 3-inch. If you can physically fit one, I reckon a 3½-inch system with an equally sized high-flow cat and straight-through muffler ought to bring out another 10 - 15 percent more power (without touching boost). Then, with a little bit more pipe enlargement on the intake side, you should be able to find a further 5 - 10 percent more power. The standard management system might cause a few headaches along the way - we don't know yet, but it might run bulk rich once breathing is enhanced. Don't worry, though, coz - like the LS1 Holden - chip cookers will soon be able to hack their way into the brain box and make the necessary changes. Another obvious modification step is boost pressure - depending on the scope of the standard fuelling system, I'm guessing you should be able to turn the wick up to about 12 psi without any major reliability issues. Chuck these mods together - which needn't add up to more than about 4 grand, by the way - and your turbo Falcon will be an easy 13-second car. Who knows - it might even be a 12-second contender if has a decent amount of traction! 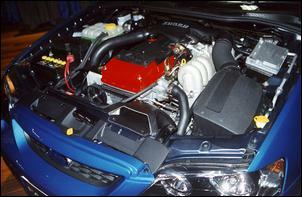 The 5.4-litre DOHC V8 also has immense tuning potential. Once the Ford ECU is 'cracked' it'll be easy to tune for maximum performance once you've fitted, say, an extractor/exhaust package and intake. Oh, and then you can develop new camshafts, modify the heads or even - gasp - bolt on a blower! Once fairyland power is now a reality. While Ford Australia has been deadly serious about upgrading its product range and image, the new Toyota Camry - which looks terrific in press-release photos and television ads - doesn't look like it'll bring any major changes for the company. From a personal perspective I had my fingers crossed that the new Camry would have the pizazz that would lure customers in to what appears to be a very practical, well built and reliable vehicle. In the past I've found the Toyota Avalon is all that, but I reckon it went down the gurgler largely because it was so damn boring to look at. Anyhow, I have to say I came away from the launch very disappointed in the new product. 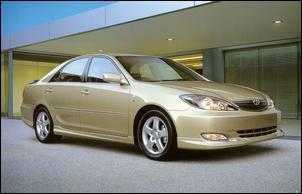 Yeah, sure, all those practicality and quality attributes were there, but - again - here was another Camry yawn mobile. Yes, it does look better than the previous model, but once you see a few Government or fleet base-spec versions pottering around the place I reckon you'll barely notice them anymore. The Sportivo model - with its body kit, lowered stance and alloy wheels - looks reasonably tempting up close but, hmmm, it's nothing spectacular. What's even more disappointing is the lack of extra power in the Sportivo - with the option of just an 112kW 4-cylinder or a 145kW V6, there's not going to be a lot of straight-line performance. Mitsubishi's Magna Sports/VR-X/Ralliart, Holden's supercharged S Commodore and Ford's BA turbo XR6 certainly don't have anything to worry about.